The Exiled Prince DLC is different from the other two DLC packs. Instead of a set of missions you embark on when you start the DLC each act has a quest you must finish to continue with the DLC questline. Also note that in Act 2 Sebastian becomes a possible companion and getting him to max loyalty or rivalry is required for an achievement. Do Repentance (the act 2 quest) to get him in your party and then follow the act 2 walkthrough like usual in order to get max friendship for him, earning you this achievement. Earn either a friendship or rivalry with Sebastian. Duty is the act 1 DLC quest. Go to the chantry at any time before going on the Deep Roads Expedition to start it. When you approach the "board" outside the chantry you'll get scenes. Read the chanter's board they were arguing at and press A to take the quest (Duty). Exit town and press RT to make it night, then enter the docks. You'll likely be attacked when you enter, kill everything. To your west is the golden marker. Go there and kill everything. Exit and press RT to bring up the world map or whatever you want to call it and enter Wounded Coast. At the fork go right, and at the next fork go right again. Kill everything and leave. Now go to Sundermount. Go forward and you'll see the last group nearby. Kill them all and go inside the chantry. Talk to Sebastian for some conversation and an achievement. Repentance is the act 2 DLC quest. Again, go to the chantry to start it and enter. Go forward and talk to Sebastian up the stairs. Now exit and go to the Harimann Estate to the south. Enter and go to the marker, the game forces you to go to certain places in the estate to see certain scenes. After a couple scenes you'll finally reach the marker. In the room with the marker is a dead body, loot it for the longbow, we will need it later. Kill the enemies and go into the next area. From here go to the marker. On the way you'll encounter two revnants and one arcane horror, they should be focused down and killed before anything else. Once you reach the marker you'll get a scene. Answer top right and then "I wouldn’t betray my friends" (top right) in the second dialog choice and then "that's a good point" (top right) in the third dialog choice. Now kill everything and leave using the nearby exit. A scene will occur, choose "you were all victims" (top right). Return to the chantry now and talk to Sebastian. Top right for the first choice, then "that's a good question" (top right) and then top right again. Achievement. Confront the culprit behind the Vael family's murder. Talk to Sebastian again and answer top right, you'll get an achievement for giving him the bow you picked up. Give Sebastian a family heirloom. Faith is the act 3 DLC quest. Go to the chantry yet again and talk to Sebastian. Top right as usual, then put Sebastian in your party and head to Viscount Keep at night. You'll have to enter Hightown and walk there though. Once inside go to the marker (Sebastian will need to unlock the door) and then you'll have a fight. Focus the mages and rage demons first. Afterward you'll have a conversation. Now head back to the chantry and talk to Elthina. You'll get an achievement afterward. Now for the Legacy DLC. Make sure Bethany is in your party and you don't take her out. Approach the Legacy statue in your mansion (if you are post game, it is one of the few places you can go heh) and activate it to start the Legacy DLC. Follow the path all the way until you get caged in with a bronto, kill everything. Go up the ramp to the north and then down the ramp to the left and open the chest for the key. Continue southeast, open the gate, and then go to the exit. Go straight forward and kill everything, then go south down the ramps and follow the path to a dead end, to find an alcove on the left, enter it and check the old box for the key. Continue east after going up the ramps. Follow the path to the exit and go inside. From here, just head to the marker. When you get there you get a boss fight. The first order of business is going up the ramp in the back and killing all the archers. Then kill the dwarf, and finally the bronto. Assuming your party is in decent shape after you kill the archers it shouldn't be too hard to finish the fight. Keep everyone away from the middle of the bottom area, there is a blade trap there. After killing everything go to the marker and enter. Go forward and you'll fight some new enemies. Kill them and in the back of the room is a prison with a shade. To your right and left will be some devices on the wall that glow red, use them both, then touch the red spot on the prison wall to release the shades. Cut it down. Continue forward to the marker and activate the seal. You'll fight a pride demon here, taunt it with Fenris and then go to town. After you kill it you can choose an elemental damage to add to your new sword. After that keep going toward the marker, you'll find a new enemy. If you are attacking his shield you do no damage so you need to be to his side or behind him. Taunt him with Fenris and cut him down, then keep going until you reach the exit. In the next area go forward, you'll run across another red switch, hit it, go past the prison, you'll be attacked. Kill everything and go into the next room to find more enemies. Kill them and then hit the second switch, then backtrack to the prison and kill everything. Go back to the big room you fought the second group in and go north one room, then east to find a codex and a Dumar relic. Continue forward and you'll reach another prison, the first red switch is on the right. Go into the next room and look left to find the second one. Wipe out the enemies in the prison. That's the last prison, continue forward. Fight through to the marker to find the second seal. Another pride demon spawns; this one has a special trick though. When it disappears it will reappear with 2 clones. The 2 clones have smaller health bars, so the real one is easily found. I didn't have much trouble concentrating on the real one but defeating the clones first would probably make it much easier. Continue to the marker and go down. In the next area follow the enemies you see in front of you and kill them. Once you kill the first one you'll get an achievement. Kill a genlock, genlock alpha, hurlock alpha, bronto, and deepstalker in the Vimmark Mountains. 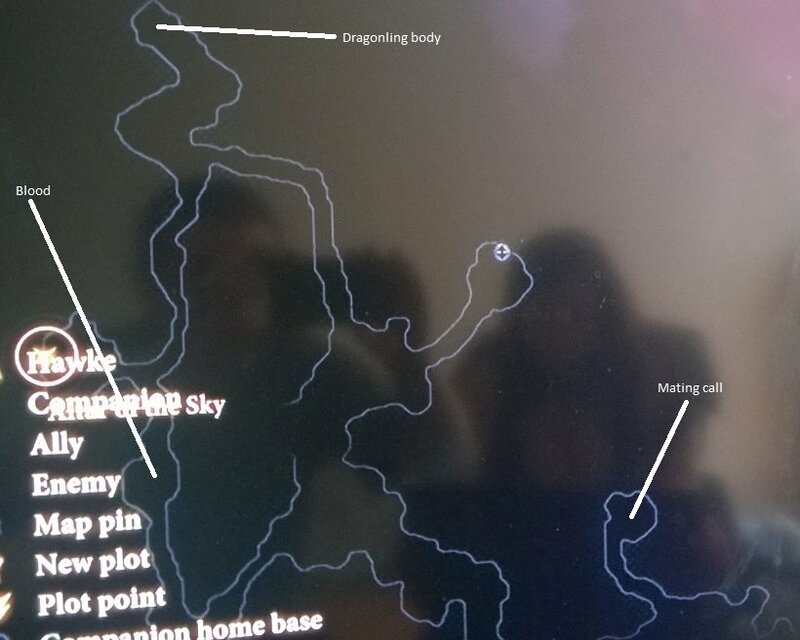 In the southern dead end of this area is a journal page, read it. Continue forward until you find a rather challenging fight. You'll have a hurlock alpha and the guy with the obnoxious shield at the same time, along with a bunch of vanilla enemies. You'll need Fenris to keep the two big guys busy with taunt while everyone else wails on them, and then have your rogue concentrate on the smaller enemies that spawn. Don't be afraid to spam health potions and use Bethany's heal and such to keep everyone alive. 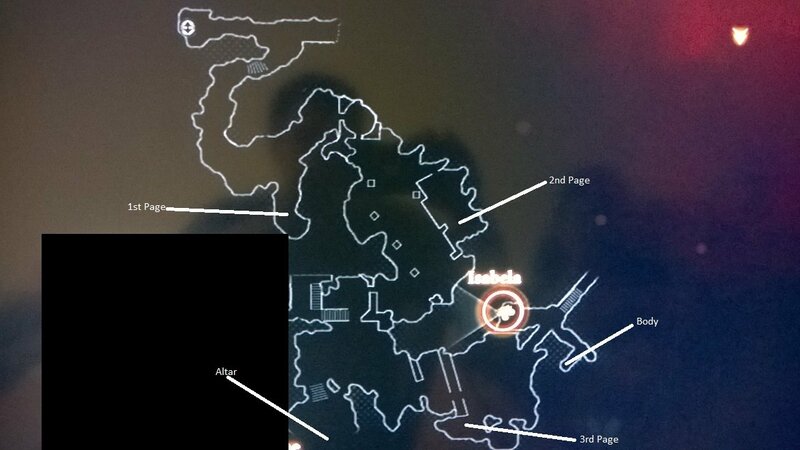 After the fight the building in the east part of this area has the second journal page. Go south to the next big area, and then south again to find Dumat's altar. Press A on it and then defile it (top right). Kill everything and continue. Go east to the next big area and kill everything. To the south is the last journal page. From here go northeast but before you exit turn right and then follow the dead end to a body, finishing the last side quest of the DLC. You'll get an achievement. Complete every side quest in the Vimmark Mountains prison tower. Continue to the marker for the last seal. This demon also makes clones of itself but their health bar is just as long. After taking enough damage clones disappear, if it's the real one all the clones disappear. After killing it you'll pick a third upgrade to the sword and then get an achievement. Apply three effects to Hawke's Key. Continue forward. In the scene that occurs keep answering top right until “you're right Janeka” pops up and choose it (bottom right). Now go south and then east to the marker. Hit the torch that isn't by the barrier to open it. Now continue east and then south and finally east. Hit the torch here to continue south. When you reach a fairly big room there will be an orange torch on the right, hit and then go west. Continue to a boss fight of sorts. The 3 golems turn invulnerability barriers on and off as each other's HP goes down. Just wail on whichever golem doesn't have a barrier up until they all die. Then go south to the exit. Go forward and then when you get a scene answer “Fine Larius I'll help you” (top right). Then activate the four altars and prepare for the final boss. At the start simply wail on him until he asks Dumat for power. At this point you can't hit him, and the 4 altars you just activated will have to be used again to make him come back down so you can hurt him. When he goes to the middle he will start shooting two jets of flame that will circle the room, so not only do you have to kill the enemies, you have to hit the altars AND keep your party out of the fire. The best way to do this is to enter an alcove with an altar, hit it, wait for the fire to pass (it will hit you, but do pitiful damage) and then move on to the next one. If you are in the building the flames will decimate your party, so this is the safest way to do it, even if it is slower. Once you've hit all four he will come back down. Attack him again until he disappears. This time he creates rocks you have to move around on top of the fire jets. Same strategy. After he goes to the middle a third time he summons icicles that will fall on you and electricity will arc between the rocks, but both of those do little damage. Cut him down again and you'll get an achievement. Defeat an ancient evil in the Vimmark Mountains. Now talk to Larius. After the scene with him you'll get another achievement. Complete the main quest in the Vimmark Mountains with Bethany or Carver in the party. This DLC pack is finished. Use the statue. After the scenes you'll have a fight, after the fight, you'll have scenes, after the scenes, an achievement. Pick up the letter off the body and leave. A bunch of scenes, then talk to Gabriel. There is a shop left of the door if you need it. Now exit southwest. From here go north up the steps, and take a right to find some dragons. After killing them all you'll be able to loot one of the bodies for a small scene. Now go south (what would have been left at the fork) keep going straight south until you reach a clearing with blood, examine it. Now keep going south until it turns north, then go east in the clearing. After the first group of hunters but before the second group should be a path to the north, go to the dead end and check the andraste's wrath for a cutscene. Now continue east to the next area. Go east and then north at the fork and follow the path to some wyvern poop, examine it. Now return to the entrance and go south to find some ghasts, afterward check the west side of the area for a halla body. Return to where the poop was and continue going north until you reach the baiting spot. Examine and say “Use everything at once” bottom left). An Alpha Wyvern will spawn. Nothing too hard about this fight, just taunt him with Fenris and go crazy. You'll get an achievement for killing him. Lure and kill an alpha wyvern near Chateau Haine. Afterward go back to the Chateau (where you start after the ambush) and choose to end the hunt. After the scenes you need to talk to a guard, there is one on the northern side of the middle area, shaped like a square, talk to him. Now talk to the elf servant on the southwestern edge of the fountain to the west. Now we want to talk to Lord Cyril, who is in between the fountain and the square area that had the guard. After the scene open the door and go inside. Choose “but not you?” (bottom left). Now go to the door north of the fountain and go inside for a scene. In the dialog choose “I agree” (top right). Go up to Tallis and then turn left to see the first guard. Press X and then move the cursor in front of the guard and to his right. When he goes to the rock go forward and then left. Go forward a bit and in the shadows should be a marker, go to it and you'll cloak. Some guards will pass by while talking. Once they pass by keep going forward and Tallis will appear to show you where to go. A guard nearby will get a marker, go up behind him and press Y to knock him out then take his key. Go up the stairs and open the door, then Tallis should appear, follow her. Go up the stairs near her and go forward, you'll see three guards. One will be at the railing (won't move), one will be in front of the stairs down (won't move) and one will be moving around near them. You want to wait until the one that moves around moves up to the railing, and then right, then knock out the guy watching the stairs and the guy at the railing and go down the stairs and through the door. Go forward and through the next door, then through the door in this room as well. To the west is a locked door we need to get through, to the south is a room with the key. There's a square passage around it that has two guards circling around the room. Knock them out or evade them and take the key, then go to the locked door I mentioned. Go through it and follow the path until you are back outside. Knock out the guard at the top of the stairs. 2 more guards will be on your left, wait for them to face away and then go to the door (it is locked). Hide behind the plant and wait for them to pass again and hug the right wall to reach the guard, knock him out. Knock out the guard by the table and take his key. Now you need to go in the door. In my case the two guards in the middle got split up so one of them was always facing me, this happens if they catch you. Just keep getting caught until they are lined up again if this happens. Continue forward until you get a scene. Move Hawke onto one of the floor switches and then Tallis on the other. Now go up the stairs to your left/right and have Tallis stand on the switches on one side, and Hawke on the switches on the other side. Move them forward one by one until you are both in the back, then knock the statues over. Now return to the middle of the room and the path to some switches near the door should be open, have Tallis/Hawke stand on different ones, then open the door for an achievement. Evade vault security in Chateau Haine. Scenes and stuff. After everything you'll want to go into the vaults (east of where you start) instead of going to the marker. In front of you will be a “black apparatus” and a white one. When you activate one the character that used it has a symbol appear above their head, the color tells you what they have. So have one character activate the white one, and someone else uses the black one. To the apparatus' left are two doors, you'll see they have white symbols under them, meaning you can open them if you have the white symbol. Go through the right white door and then have someone take the orange, and open the orange door nearby. There is a black door in this room as well, use it and have someone take the blue. Through the orange door should be a blue door on the right, open it and kill the enemy inside. For some reason you lose your colors...get white and yellow back and then go back to the first room and go south until you see fire. Once you've finished all three puzzles you'll get an achievement. Disarm the fire traps in Chateau Haine's vaults. From the chest in the traps go south for some scenes, kill everything. Afterward go into the door to the dungeons, it is to the right of the door you enter, not far into the room. Go straight ahead and enter the crack in the wall. From here, go east. About the path turns south you'll get a scene and a fight. The fight isn't too hard; just make sure you kill the mages first. After the fight continue south until you get more scenes. You have two exits, one where Tallis leaves and one where she doesn't, which you choose is irrelevant. Follow the path northeast until you can go straight east and then do so. Continue until you reach a fork. A marker will appear on a talvashoth officer, you need to chase him down and kill him. Once you do backtrack to the marker and enter. Scenes and stuff. In the beginning simply attack the main boss (you know who) while staying out of the acid on the ground (use the move to position button to move allies out of it) Eventually the wyvern will take the field, taunt it and go crazy. Note that when one of your allies gets hit by the green arrow, the wyvern will focus them and you can't do much about it. However, you can take advantage of this by taking control of the character that gets hit and running in circles around the wyvern, it seems to get confused and has trouble hitting you. Once you do enough damage the main boss gets on the wyvern. From here it's a pretty standard fight, just use everything you have, taunt with Fenris, and when someone gets hit with the green slime, take control of them and run around. The boss will occasionally jump on the stone wall and then shoot explosives. There are lights on the ground that show where the explosions will happen so you can attempt to dodge them. After killing them you'll get a bunch of scenes, and then finally this achievement. Upgraded a spell or talent. Defeated the rock wraith on your expedition into the Deep Roads. Flirted with one of your party members to begin a romance. Earned either a friendship or rivalry with Sebastian. Sided with the mages five times. Defeated Meredith, knight-commander of Kirkwall's templars. Sided with the templars five times. Dealt with the mercenaries that killed the Vael family. Confronted the culprit behind the Vael family's murder. Gave Sebastian a family heirloom. Killed a genlock, genlock alpha, hurlock alpha, bronto, and deepstalker in the Vimmark Mountains. Completed every side quest in the Vimmark Mountains prison tower. Applied three effects to Hawke's Key. Defeated an ancient evil in the Vimmark Mountains. Completed the main quest in the Vimmark Mountains with Bethany or Carver in the party. Lured and killed an alpha wyvern near Chateau Haine. Evaded vault security in Chateau Haine. Disarmed the fire traps in Chateau Haine's vaults. Defeated Duke Prosper, with or without Tallis.